Hi foodies..Welcome to AYESHA'S KITCHEN. 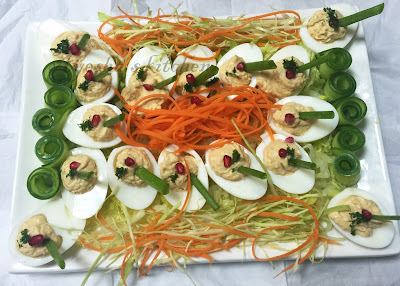 Here is a wonderful egg salad recipe for making parties something special. A salad with deviled eggs, which is also known as stuffed egg salad, angel eggs, dressed eggs and so on. Here the hard boiled eggs are sliced in halves and filled it with egg yolks mixed with other ingredients. Deviled eggs are usually served as a side dish, appetizer, or a main course. Commonly used for enlightening parties. So lets go through the recipe. Here it is... Do try and drop your feedback...!!!!! Cut the hard boiled eggs length wise in half. Take the egg yolks out and mash it in a bowl with a fork. Add cream cheese, mayonnaise, yellow mustard, pepper powder, paprika . Mix well with the yolks. Then fill or pipe the egg whites with the yolk mixture. Garnish with small piece of celery, dill leaves and bunches of vegetables.